Some of my earliest memories are of spreading National Geographic maps out on the floor of my living room, picking a faraway place on the planet, and imagining myself on a different continent. Fast forward a couple of decades to 2008, and National Geographic is still inspiring young people to explore our globe. For the third year in a row, Google is delighted to work with My Wonderful World, a National Geographic-led campaign to give kids the power of global knowledge, on Geography Awareness Week. Beginning today, students and teachers alike can explore a range of geo-activities using Google Earth. Working together on projects like this, that encourage people to roll up their sleeves and explore the world, is what Google's Geo Education initiative is all about. Did you know that the Lake Victoria water level is dropping, impacting the daily lives of 30 million Ugandans, Kenyans, and Tanzanians? 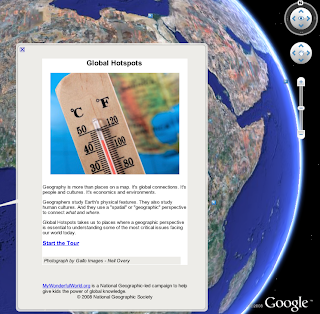 Take a geo-tour of global hotspots to see how geography can help us understand critical issues facing the world today. Did you know that dining in certain fast food joints in Japan can be a very elegant experience? 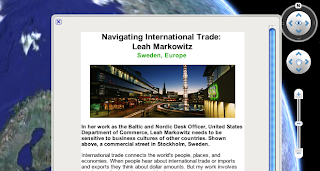 Or that grocery shopping in Russia is often more of a negotiation than a transaction? With National Geographic's Glimpse, you can hear from young people living and working around the world and see their stories in Google Earth. Visit the Google for Educators site to learn more about these initiatives and to start exploring today!